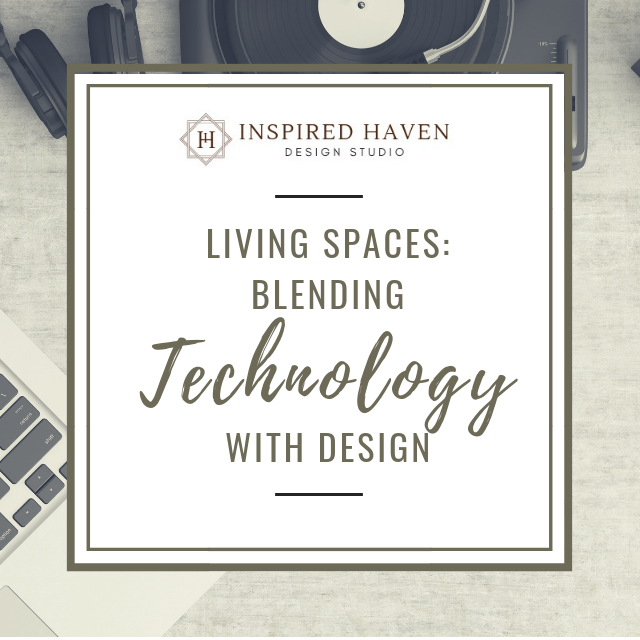 Given how much technology matters at home, it’s no surprise that one of the most common requests I receive from clients in the design process is to make sure we provide adequate and easy access to their connected devices. At the same time, we want technology to be seamless with the design of our homes. Gone are the days of housing the family TV inside an armoire in the living room. Today’s home is often more minimal and modern, with the TV often in full view as part of the room’s design. 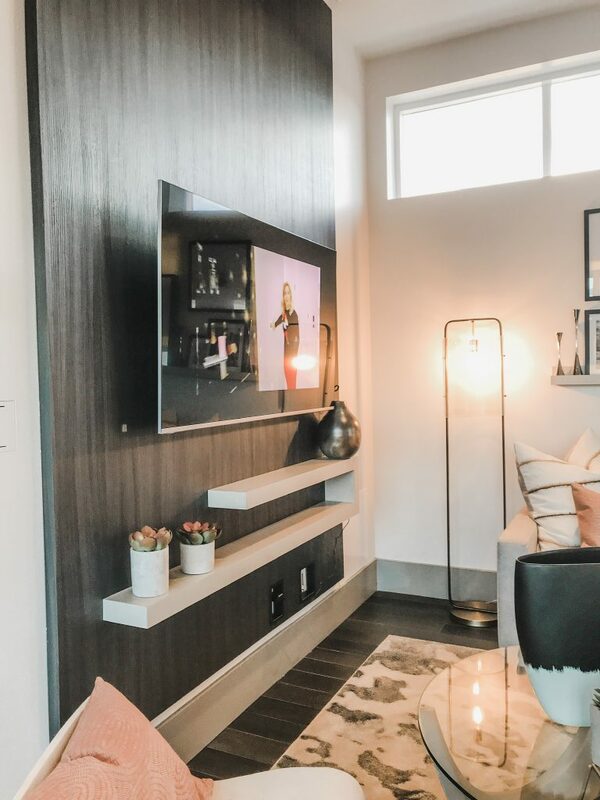 In fact, with a television mounted to the wall, the need for a furniture piece to hold the TV can be eliminated entirely, allowing for a much more streamlined and clean aesthetic. The cables can be concealed in a chase behind the wall surface. Wall mounted TV at the KB ProjeKt Home in Henderson, NV. As shown in the photo above, when the TV is mounted to a feature wall using tile, stone, decorative paneling or even over a dark accent color to minimize contrast, the TV becomes part of the decor instead of a visual interruption. The decorative shelves below also serve to conceal the cord that is running up the wall. Sliding doors. If the TV is flanked with bookcases on either side, sliding doors can be installed to cover the TV and then slide over to cover the bookcases when the TV is on. The benefit is it minimizes the depth required since everything sits flat against the bookcases. The downside is you need to have adequate space in both directions. Theoretically, the sliding doors could be stacked to one side, but then the TV needs to be boxed in on the opposite side to avoid an awkward gap on the exposed side behind the doors. Bifolding doors. A boxed frame can be installed around the TV to create a very shallow cabinet with bifolding doors. The drawback to this option is that the doors will project from the wall when fully opened and this may block or interfere with the view of the TV from some parts of the room. The benefit is it doesn’t require as much wall space as the sliding door option. Hinged artwork. Same as the option above, except that instead of cabinet doors, framed art, photos or mirrors are connected to one another and hinged just like doors so they can fold back when the TV is in use. This is not a product that is currently on the market, so it would need to be custom built. Retractable artwork. Rather than install doors of any kind, a pull-down map or mural can be installed above the TV. Simply pull it down to use as a focal feature when the TV isn’t in use, then retract it into its rail when you are ready to watch. This may require the rail to be furred out a few inches from the wall to make sure it clears the TV when it is raised and lowered. Laptops and Tablets and Smartphones, Oh My! The common spaces in our homes also function as homework zones, ad hoc work spaces, and a comfortable place to use connected devices. Whether we are responding to emails, scrolling through social media feeds, shopping online, syncing calendars with other family members, or planning our next vacation, we tend to have our phones and tablets and laptops at the ready in our kitchens and living spaces. Many of us who work from home find that rather even with a home office, we tend to bring our work into the social spaces in the home for at least a part of our work day. And most home security companies now offer smartphone integration that allows us to see who is at the door or check motion activity at the driveway without leaving the sofa. One of the big challenges is concealing the cords and cables that allow us to keep all our devices within reach. This is especially true when combined with a more modern aesthetic, where every piece in the room is carefully curated to create clean lines. Pro tip: When planning furniture placement, it’s helpful to allow for some flexible furnishings that can create a space to sit and work with a laptop just about anywhere. Several manufacturers are getting on board with sofas, chairs and tables with USB and power outlets built in, so the cord goes to the back of the furniture and the receptacle is handy, but blends in well. A less expensive option is to buy extra long cords for smartphones and tablets and run them under and around furniture so the cord is always at the ready. Where possible, clips can be used to secure cables as well, so they can be run down the wall behind decorative items, clipped to table legs and other furnishings so conceal them from view and line them up exactly where you’d like them. This works well for other devices that live on accent tables, such as Portal, Alexa or the Google Home Hub as well. While personal assistant technology may need to be front and center for music and web searches, you can create a vignette they can be nestled into so they blend into the decor. Knee space outlets. At island knee spaces, plug mold can be installed out of sight where the cabinets meet the counter (if it does not conflict with the cabinet doors). Pop-up outlets. If the back of the island has functional cabinets, it may not be possible to install an outlet where you need it. An alternate is to have a pop-up outlet installed on the countertop. When closed, the countertop can safety be sprayed and washed, but when open, additional electrical outlets and USB ports can be easily placed within reach. This is a great option for islands in general, because it eliminates the need to place an outlet on the face of the cabinets. Charging Drawers. For those who prefer a charging center that is out of sight, charging drawers are a popular solution. The challenge in the past was how to safely put a receptacle inside a drawer, but newer product introductions have solved that challenge and made this an option for any kitchen. Tablet stand. Some cabinet and accessory manufacturers now offer pull-down tablet racks that attach to your upper cabinets, so you can have your tablet charged and at the ready with the recipe you’re looking for while cooking in the kitchen. Whether you are looking to build a dedicated home office, study space, or a connected living space, a good professional will always ask the right questions to make sure all of your needs are taken into consideration when designing your space. With some thoughtful planning, you won’t have to worry about finding an extension cord to work and be social from home. Need some help planning? Contact me today to get started!